We are proud to announce Metallic Masterpiece will be standing to the public at the Legendary 6666 Ranch. 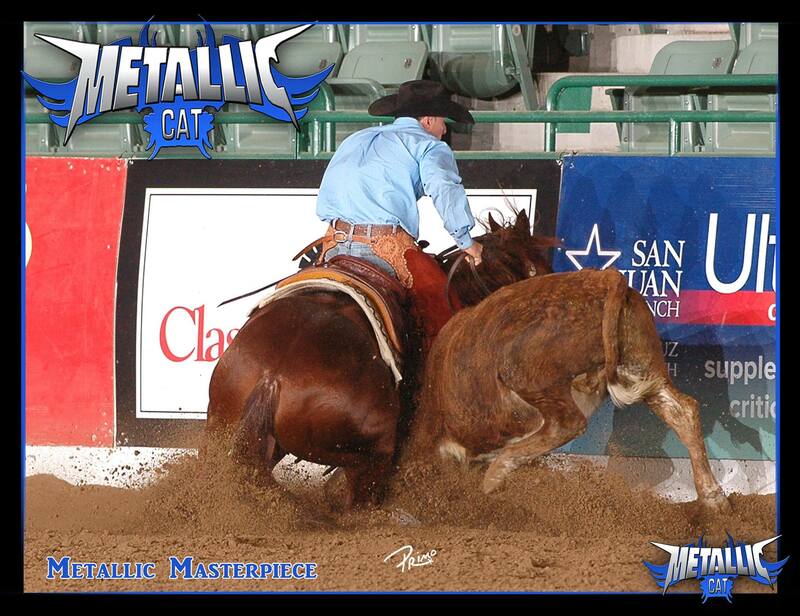 We are thrilled to have an own son by Metallic Cat to not only emhance our breeding program but put our mark on the performance horse industry. “Quasi” may not be the biggest in stature stallion, he is mighty in heart and try. He possesses the athletic ability of a champion combined with a trainable mind. 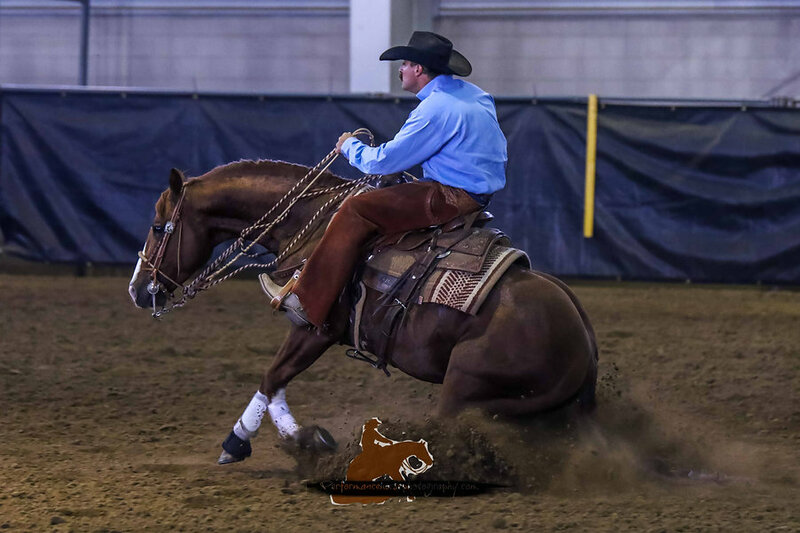 We are fortunate that this stallion has been used in branding and ranch work, as well a, being an open finalist in the prestigious NRCHA Snaffle Bit Futurity. He was used for breeding for the first time in 2016 and we are extremely excited to see them grow. His greatest contribution is excellence in the performance horse arena. Quasi is currently in training with and shown by Kyle Trahern. Sired by HIGH BROW CAT’s #1 Money Earner and #1 NCHA Leading Sire METALLIC CAT ($637,711), whose foals have earned $16 Million. Out of Equi-Stat Top 25 All-Time Leading Reined Cow Horse Producer and an NRCHA Top 25 All-Time Leading Producer KINGS MASTERPIECE. A half-brother to AQHA World Champion Junior Working Cow Horse GENUINE MASTERPIECE $66,795); NRCHA Open Futurity Reserve Champion SPARK MASTER ($99,486). In the much-beloved 1996 Disney classic, “The Hunchback of Notre Dame”, we meet the malformed bell-ringer of the Notre Dame cathedral, Quasimodo. Misunderstood and mocked by the locals, Quasimodo rises above and after a series of events, driven by love and heroism, is celebrated as a hero and accepted into society. In 2011, a sorrel colt with four socks and a big blaze was born at Wagonhound Land and Livestock in Douglas, Wyoming. The Wagonhound has produced performance superstars, including stand-out cutting horse stallion, WR This Cats Smart. It was no doubt the little sorrel colt was intended for the same path. The colt was by one of the stand-out stallions of our era, Metallic Cat and out of Kings Masterpiece by Peppy San Badger, one of Equi-Stat’s Top 25 All-Time Leading Reined Cow Horse Producers. So regally bred that his name echoed the same sentiment, he was registered as Metallic Masterpiece. As a baby, still on his mother’s side, Metallic Masterpiece was in his stall when he ran into a wall and crashed, breaking his back in the process. It would seem that’s where the story would have ended, but, it was just the beginning. Metallic Masterpiece and trainer, Kyle Trahern. The Silver Spur Ranches have operations in Wyoming, New Mexico, Colorado and Nebraska including the historic TO and Bell ranches. The ranch currently holds the title of the ninth largest commercial cattle operation in the United States and in 2017 was awarded the prestigious Zoetis AQHA Best Remuda Award. The Silver Spur Ranches is owned by telecommunications giant John Malone and his wife, Leslie, who themselves are accomplished horsemen and philanthropists. Each division of the Silver Spur has it’s own managers and employees, and is overseen by Thad York, general manager of the Silver Spur Ranches. York is the third generation of his family to work for the Silver Spur, he and his wife, Kristen, are heavily involved in the operations of the ranch, and are passing on the history to their son, Kasen. “When my husband took over in 1999 we didn’t have a huge horse program. Thad felt strongly that we needed to use horses on the ranch, he felt it was very important to keep the tradition of the horse program, and build it from there.” The York’s acquired WR One Eyed Jack for the Silver Spur, a son of WR This Cats Smart out of Miss Ann Oleana by Miss N Cash. WR One Eyed Jack was aptly named, “We got a call about a horse who had cutting blood lines but had lost his eye as a foal. It was a son of WR out of Miss Ann Oleana, a mare who had won the NCHA Pacific Coast Futurity and quite a bit of money. So here’s this foal that they had high hopes for that had no eye. Al Larson owned him and asked if we’d be interested in him as a stallion prospect. He had great lines but they didn’t have a job for him.” At the time the Silver Spur was breeding mainly foundation-bred horses and felt the influence of cow-bred bloodlines would be a bonus to their program. 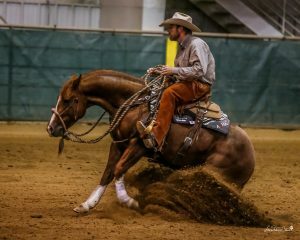 “WR One Eyed Jack was really great for our program, he started to put some contemporary cattle blood in our line.” The stallion produced multiple great horses, including Versatility Ranch Horse world champion SS Hey One Eye. In 2014, Quasi’s three-year-old year, Trahern took the stallion to a small futurity to see how he’d do – he stepped up to the plate. 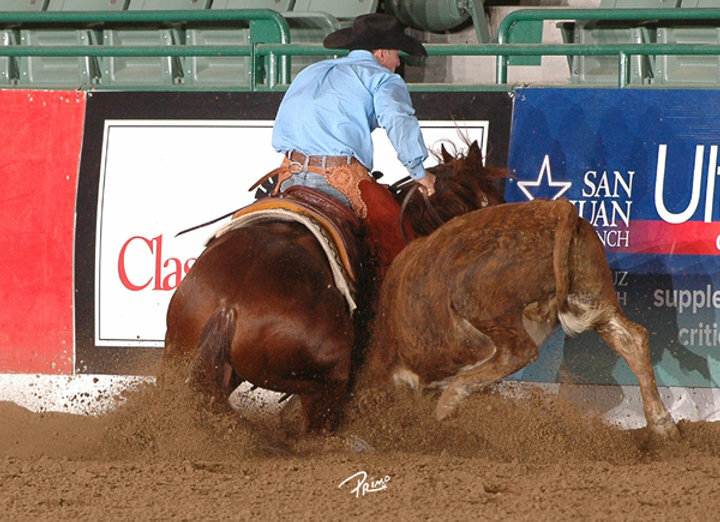 Trahern decided that the duo would set their sites on the crown jewel of cow horse, the NRCHA Snaffle Bit Futurity. “Quasi really came on at Snaffle Bit, Kyle made three level finals on him.” For the Silver Spur Ranches, Quasi was their first cow horse to hit the Snaffle Bit, and he did it in a major way. York laughs, “It was so cool, they bring all the finalist owners out on a red carpet, and after it was all over I kept thinking it was a dream come true. 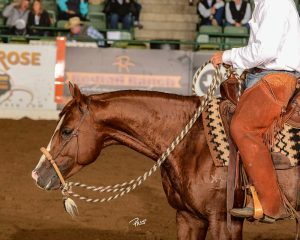 Everyone told me jokingly, ‘hey, this isn’t how every snaffle bit goes.’” Quasi continued to defy expectations, winning the NRCHA Intermediate Open Derby Reserve Champion, and continuing strong throughout his classic years. Now seven, he has amassed $72,149 in cow horse competition.